In other news, if you live in Los Angeles, you're going to have to shell our $1 more than you're used to for the cookies. 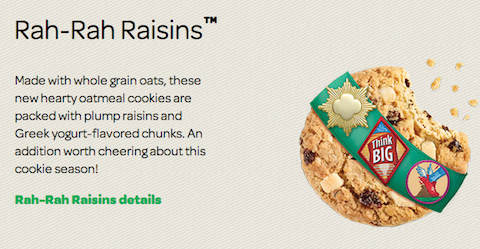 The good news: Two new flavors will be joining the Girl Scouts Cookie lineup in 2015—Toffee-Tastic and Rah-Rah Raisin. The Toffee-tastic cookies will be butter-based and gluten-free, and they’ll have crunchy toffee bits inside. The Rah-Rah Raisin, on the other hand, are made with whole grain oats, and will have raisins and Greek yogurt-flavored chunks mixed in. Gluten free and Greek yogurt!? Way to follow food trends, Girl Scouts of America. The bad news: If you live in L.A., a box of GSC will cost you $1 more than last year. Considering how much some people in Los Angeles already spend on gluten-free baked goods, we’re not sure anyone is going to care. And we’re sure you already know that Girl Scout Cookies can now be purchased online, which was arguably the most important news of 2014.